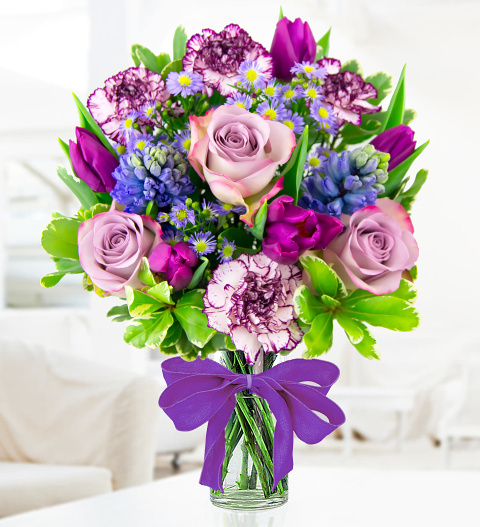 This bouquet makes a simply beautiful arrangement with fragrant hyacinths, antiqua carnations and British grown tulips, perfect to send the very best of Birthday wishes. Each bouquet is beautiful hand-tied by our expert florists and fashioned with artisan floristy finish with beautiful Dutch grown memory lane roses. The bouquet is finished with beautiful aster flowers and pittosporum to make a spectacular arrangement. Perfect for all Birthdays, this is one to be remembered.
. Chocolates may contain nuts.